Today's imaging modalities provide a wealth of diagnostic information, but also present a challenge to your Radiology workflow as patient exam sizes continue to increase while your time for reading and reporting decreases. Volume Viewer provides you with a rich 3D image processing toolset aimed at creating and displaying the views you need with minimal user input, and streamlining interpretation and reporting for multimodality exams. Volume Viewer provides excellent 3D visualization and processing capabilities for reading and comparing CT, MR, 3D X-ray, PET, PET/MR and PET/CT datasets. Volume Viewer also features a broad portfolio of high-performance analysis tools, automating routine tasks and helping to make 3D image processing a stress-free component of your routine workflow. Powerful SW platform for multi-modality clinical applications. Compare multiple exams from different modalities at loading and on the fly1. Easy point-and-click segmentation tools for segmenting structures of interest. Rich set of 2D/3D ROI tools, including AutoContour for 3D semiautomatic contouring of structures of interest (CT, MR, PET), and ROI color coded for tissue classification based on voxel values. Compare mode for reviewing multiple exams and modalities, simplified with Dynamic Load to load and register1 new series into the current review session. Automatic image loading and processing with AutoLaunch and One touch protocols. Smart Layouts with VV General Review. Direct access to favorite tools on the review controller. Drag and drop tools customization. Protocol management and loading with “My Protocols.” Accessed with one button click. Dynamic Volume Review provides an interactive view port control for Cine, slice paging, and slice thickness adjustment. Enhancing and smoothing filters to improve CT image quality. MR Volume Viewer provides access to all 3D tools, recognition of PSD name, image weight, scan plane and specific MR parameters at loading. Curved VOI allows display of MIP, MinIP, or VR ROI along a curved projection. AutoSelect segmentation tools with easy point and click segmentation of blood vessels and other structures of interest. Annotation tools to mark findings and regions of interest. Fast and reliable volume rendering. Enhanced rendering of structures with high contrast. Creation of multiple volume rendered models that may be merged into a single view. Navigator view display with Best Guess threshold. Interactive 3D export to QuickTime1 VR objects. An updated and expanded Volume Viewer (Voxtool 11.x) is available for AW Volume Share 5 and AW Server 2.0. 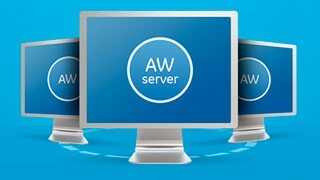 The installed base of AW 4.4, 4.5, 4.6 (8400xw, xw8600, and z800 workstations) and AWS 1.0 will support software upgrades to this Volume Viewer release. (Older AW platforms may be upgraded to 11.x with a hardware upgrade).